This post was first published by Croydon Advertiser on 09/07/2018. The main route from the M25 to Croydon is due to be widened through Hooley but residents are not happy with the plan. Residents are threatening to block the A23 in protest should work to widen it through Hooley go ahead as planned. Highways England wants to expand the main route from the M25 and M23 into Croydon in an effort to tackle congestion. Work is expected to get underway soon to expand the northbound side so that it has two lanes from the Starbucks at Dean Lane to the existing dual carriageway at the Netherne Drive junction. 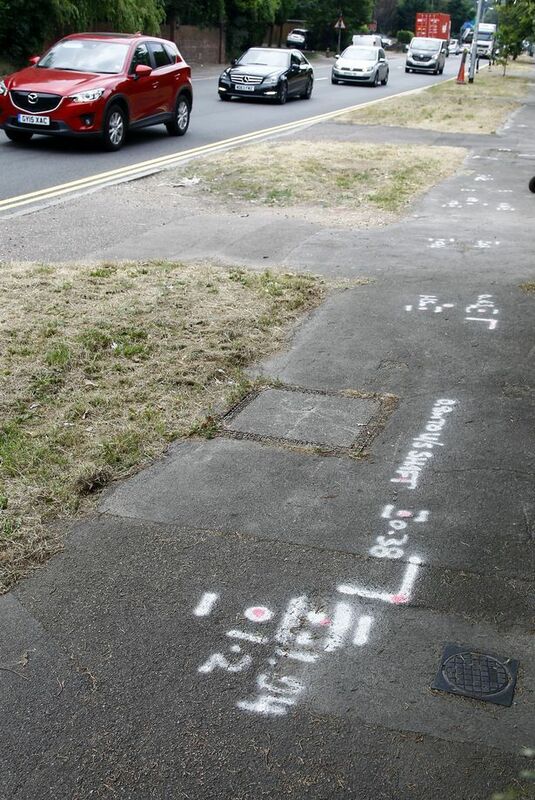 The project will cost the government around £3.5 million and preliminary work has already begun, with a host of spray-painted marks on pavements at the side of Brighton Road as part of survey work for the scheme. The expansion will take over eight months to complete and the actual road widening is currently earmarked to start in early 2019. However, Highways England says any feedback from residents will be taken into account before the major work begins. Highways England says the expansion will resolve the current bottleneck situation on the road, however, some residents are objecting and feel that it will simply move the problem a few hundred metres down the road. The work will result in residents along the three-quarter mile long stretch having to contend with up to four lanes of traffic outside their homes. Andrew ‘Danny’ Daniel, chairman of Hooley Residents Association, 60, said: “This is a waste of taxpayers’ money. “We’re all going to fight it and we’ll block the A23 in protest if this goes through. Residents are absolutely and totally against it. Highways England aren’t addressing the issues of traffic flow through Hooley and they won’t listen to us. Although the scheme will also reduce the speed limit through the village and install a new shared cycle path, Mr Daniel said the money would be better spent installing a new roundabout junction connecting the A23 with the M23 and M25, which he says is “35 years overdue”. Highways England will be holding a public information event at Hooley Village Hall on Friday, July 27 at 8.30am until lunch and again from 4-7pm. There will be an additional event on Saturday, July 28 from 9-11.30am. The project is already funded but any significant opposition could see it adapted. A spokesman for Highways England said: “This work is part of a region-wide motorway and A-road junction improvement programme which will deliver benefits for people living and working in the South East. “On the A23, these improvements will include widening the road around the junction, upgrading the traffic lights to improve efficiency, reducing the speed limit through the residential area, and introducing a shared route for pedestrians and cyclists.